Aku mendapatkannya ketika acara Grand Opening Kay Collection di Grand Indonesia beberapa waktu lalu. 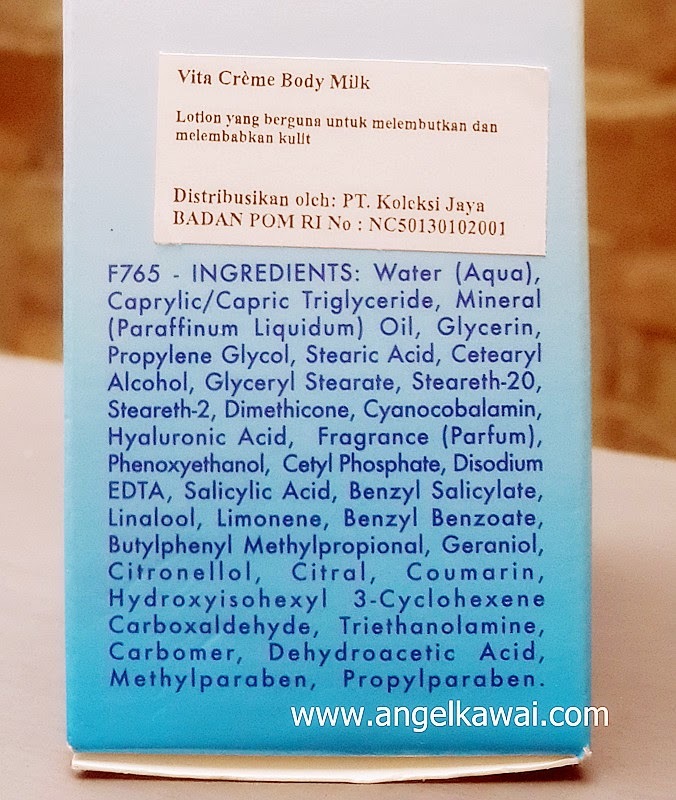 VITACREME Body Milk ini mengandung Vitamin B12 yang berguna untuk melembabkan dan melembutkan kulitmu. 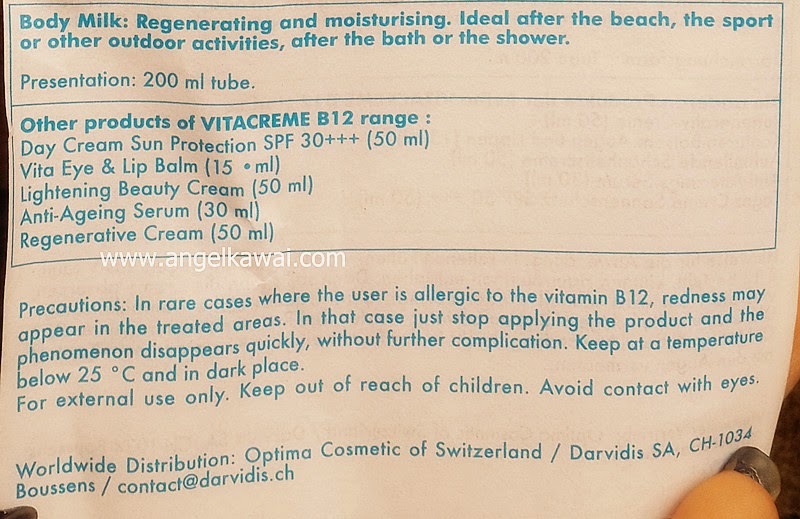 The skin treatment of the brand VITACREME B12 are formulated and manufactured in Switzerland, country of tradition in the heart of Europe. The raw materials, carefully selected, are innovative and proven effectiveness. The formulations comply with the international legislation and cosmetic directives. The finished products are tested under permanent supervision of the Swiss Vitamin Institute. 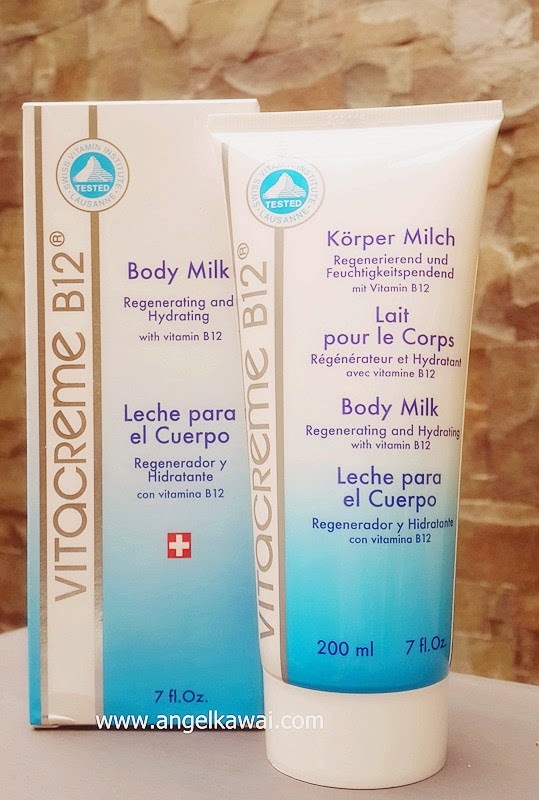 The basic ingredient, guiding of all VITACREME B12 products is the Vitamin B12 (cyanocobalamin). The pharmacological studies have shown that Vitamin B12, when applied in percutaneous application, increases the elasticity of tissue by promoting the reorganization of the network of elastin fibres and the production of collagen fibres, thin and regular. This action has the overall effect of "rejuvenation of the skin". The results of these pharmacological studies have been corroborated by clinical tests conducted with the regenerative cream VITACREME B12 : very significant reduction of wrinkles and folds of skin, significant improvements in elasticity and suppleness of the skin, significant correction of dry skin. 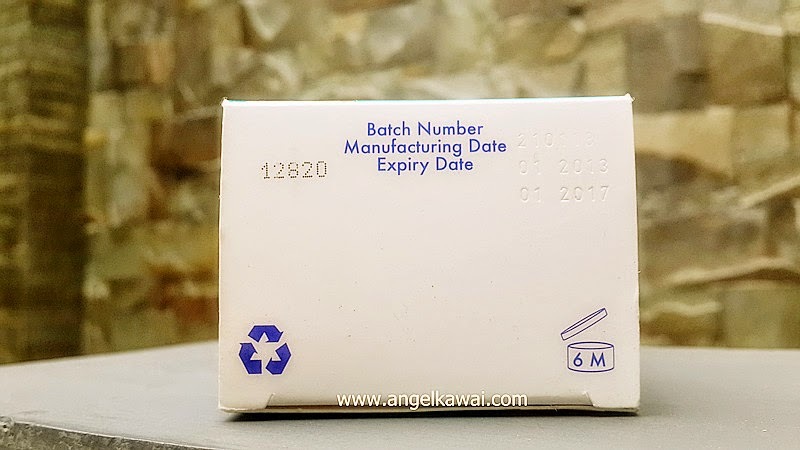 Depending the product and its application, other valuable active ingredients enriched the formulations for an improved efficiency. The VITACREME B12 products can be used daily, alone or in addition to any other treatments. Regenerates and hydrates the top layers of the skin. Ideal after sport, beach, or outdoor activities, after bath or shower. 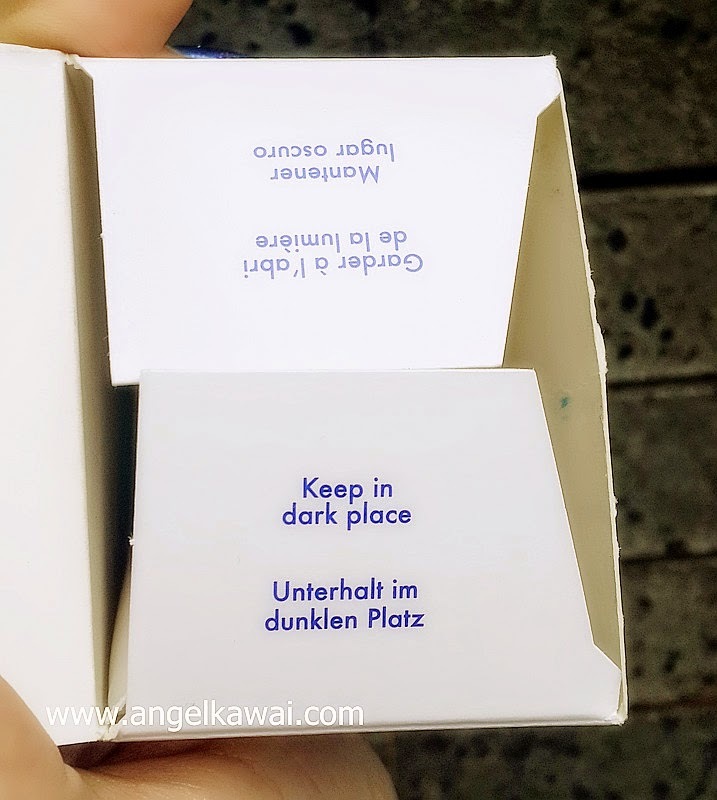 Bentuk kemasannya tube dan lubangnya sangat kecil, namun isinya cair seperti air, sehingga harus berhati-hati saat menuang produk ke telapak tangan. 1. Setelah beraktivitas di luar ruangan, bersihkan tubuhmu misalnya mandi. 2. Setelah tubuhmu bersih dan kering, maka tuangkan isi VITACREME Body Milk ini di telapak tanganmu. 3. Oleskan secara merata ke seluruh tubuhmu. Cocok untuk kamu yang biasa beraktivitas di outdoor atau di luar ruangan, contohnya berenang atau ke pantai. Membuat kulit super duper lembab! Kurang cocok untuk digunakan setiap hari bila kondisi kulit tidak terlalu kering, sebab kulit akan menjadi terasa lengket dan terlalu lembab. Harus berhati-hati saat menuang produk, sebab isinya cair seperti air. Bila tidak hati-hati maka isinya akan tumpah kemana-mana. Menurutku, produk ini tidak hanya cocok untuk yang hobi beraktivitas di out door saja, namun juga cocok untuk yang memiliki kulit yang sangat kering. Kenapa? 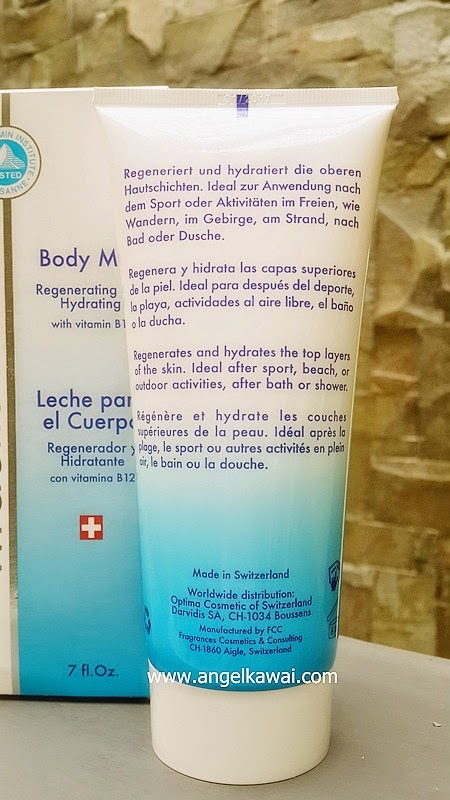 Sebab VITACREME Body Milk ini benar-benar dapat membuat kulitmu menjadi sangat lembab.